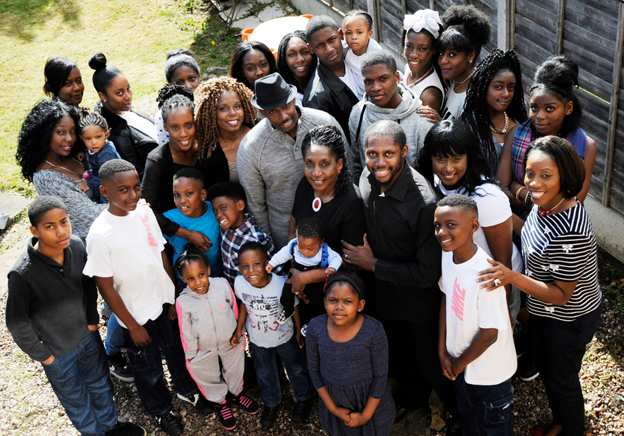 Mother, Grandmother and Great Grandmother Sonia Smith from Sheldon, Birmingham pictured with her extraordinary family consisting of 6 sets of twins. 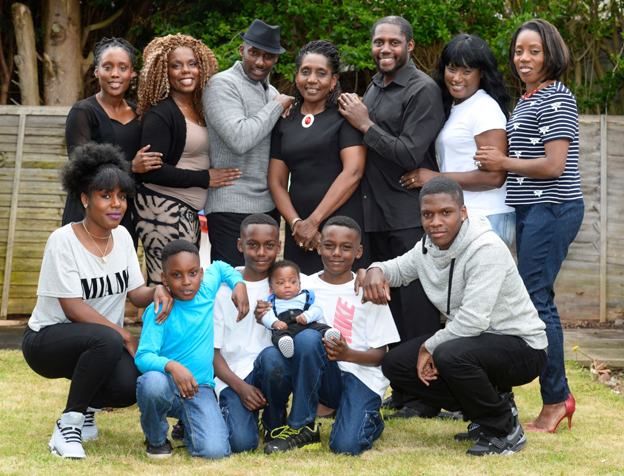 It was joy mixed with sadness for a Birmingham family which welcomed their SEVENTH set of twins. But sadly one of the premature pair sadly died, although the family is delighted at the progress of his tiny brother Miciah. Proud Sonia Smith, a mother-of-seven from Sheldon, gave birth to three sets of twins of her own plus her youngest daughter Monique. The 65-year-old was stunned when she discovered her grand-daughter Jeanette found out she was expecting twin boys – the seventh set in their immediate family. Sadly, the boys were very premature, and Shiloh born at 25 weeks did not survive the pregnancy. Miciah, born a week later at 26 weeks and barely weighing a 1lbs, is now doing well and is five months old. “He was too small and did not survive,” said Sonia. “But having twins is such a blessing. “People are amazed by it. “We are always thinking who is going to be the next one. “Some of the grandchildren even joke, that they won’t have any children because they’ll end up with twins! Double trouble first started in the family when Sonia and her first husband Clement had a boy and girl in 1968- sadly the boy died, and her daughter Denise survived. Later she welcomed Peter and Paul in 1969, and twins Ruth and Rose in 1971, and later daughter Monique in 1973- her only single child. The amazing sequence continued when Rose, who is just one minute younger than Ruth, had two sets of twins but, sadly, one set was stillborn. Her other twins, Alex and Jaye, are now aged 19. Then Ruth followed suit by having the first set of identical twins in the family, Samuel and Jacob, eight years later. Sonia, who is now remarried Gerald after losing her first husband to terminal cancer, said: “Some of them have gone off to university now and it makes me really proud. “When all the children and grand children and now great grandchildren are together, I just sit back and enjoy watching them all. “I think to myself ‘how did I achieve all this’?